Questioner: I am full of desires and want them fulfilled. How am I to get what I want? Maharaj: Do you deserve what you desire? In some way or other you have to work for the fulfillment of your desires. Put in energy and wait for the results. Q: Where am I to get the energy? M: Desire itself is energy. Q: Then why does not every desire get fulfilled? M: Maybe it was not strong enough and lasting. Q: Yes, that is my problem. I want things, but I am lazy when it comes to action. M: When your desire is not clear nor strong, it cannot take shape. Besides, if your desires are personal, for your own enjoyment, the energy you give them is necessarily limited; it cannot be more than what you have. Q: Yet, often ordinary persons do attain what they desire. M: After desiring it very much and for a long time. Even then, their achievements are limited. Q: And what about unselfish desires? Q: Humanity is God’s work, not mine. I am concerned with myself. Have I not the right to see my legitimate desires fulfilled? They will hurt no one. My desires are legitimate. They are right desires, why don’t they come true? M: Desires are right or wrong according to circumstances; it depends on how you look at them. It is only for the individual that a distinction between right and wrong is valid. Q: What are the guide-lines for such distinction? How am I to know which of my desires are right and which are wrong? M: In your case desires that lead to sorrow are wrong and those which lead to happiness are right. But you must not forget others. Their sorrow and happiness also count. Q: Results are in the future. How can I know what they will be? M: Use your mind. Remember. Observe. You are not different from others. Most of their experiences are valid for you too. Think clearly and deeply, go into the entire structure of your desires and their ramifications. They are a most important part of your mental and emotional make-up and powerfully affect your actions. Remember, you cannot abandon what you do not know. To go beyond yourself, you must know yourself. Q: What does it mean to know myself? By knowing myself what exactly do I come to know? M: All that you are not. Q: And not what I am? M: What you are, you already are. By knowing what you are not, you are free of it and remain in your own natural state. It all happens quite spontaneously and effortlessly. Q: And what do I discover? M: You discover that there is nothing to discover. You are what you are and that is all. Q: I do not understand! M: It is your fixed idea that you must be something or other, that blinds you. Q: How can I get rid of this idea? M: If you trust me, believe when I tell you that you are the pure awareness that illuminates consciousness and its infinite content. Realise this and live accordingly. If you do not believe me, then go within, enquiring ‘What am I’? 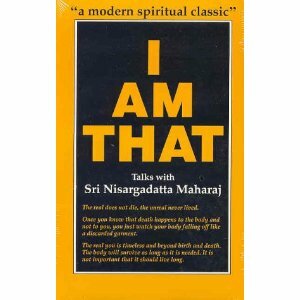 or focus your mind on ‘I am’, which is pure and simple being. Q: On what my faith in you depends? M: On your insight into other people’s hearts. If you cannot look into my heart, look into your own. Q: I can do neither. M: Purify yourself by a well-ordered and useful life. Watch over your thoughts, feelings, words and actions. This will clear your vision. Q: Must I not renounce everything first, and live a homeless life? M: You cannot renounce. You may leave your home and give trouble to your family, but attachments are in the mind and will not leave you until you know your mind in and out. First thing first — know yourself, all else will come with it. Q: But you already told me that I am the Supreme Reality. Is it not self-knowledge? M: Of course you are the Supreme Reality! But what of it? Every grain of sand is God; to know it is important, but that is only the beginning. Q: Well, you told me that I am the Supreme Reality. I believe you. What next is there for me to do? M: I told you already. Discover all you are not. Body, feelings, thoughts, ideas, time, space, being and not-being, this or that — nothing concrete or abstract you can point out to is you. A mere verbal statement will not do — you may repeat a formula endlessly without any result whatsoever. You must watch yourself continuously — particularly your mind — moment by moment, missing nothing. This witnessing is essential for the separation of the self from the not-self. Q: The witnessing — is it not my real nature? M: For witnessing, there must be something else to witness. We are still in duality! Q: What about witnessing the witness? Awareness of awareness? M: Putting words together will not take you far. Go within and discover what you are not. Nothing else matters. Osho's "Books I Have Loved"
Sat Sangha Salon Blog at WordPress.com.